Weights-of-evidence (WofE) modeling and weighted logistic regression (WLR) are two methods of regional mineral resource estimation, which are closely related: For example, if all the map layers selected for further analysis are binary and conditionally independent of the mineral occurrences, expected WofE contrast parameters are equal to WLR coefficients except for the constant term that depends on unit area size. Although a good WofE strategy is supposed to achieve approximate conditional independence, a common problem is that the final estimated probabilities are biased. If there are N deposits in a study area and the sum of all estimated probabilities is written as S, then WofE generally results in S > N. The difference S − N can be tested for statistical significance. Although WLR yields S = N, WLR coefficients generally have relatively large variances. Recently, several methods have been developed to obtain WofE weights that either result in S = N, or become approximately unbiased. A method that has not been applied before consists of first performing WofE modeling and following this by WLR applied to the weights. This method results in modified weights with unbiased probabilities satisfying S = N. An additional advantage of this approach is that it automatically copes with missing data on some layers because weights of unit areas with missing data can be set equal to zero as is generally practiced in WofE applications. Some practical examples of application are provided. An earlier version of this article was published as an extended abstract in the Proceedings of the IAMG Annual Conference held at Stanford University, August 2009. Thanks are due to Graeme Bonham-Carter, Qiuming Cheng, and Helmut Schaeben for constructive discussions during preparation of this article. 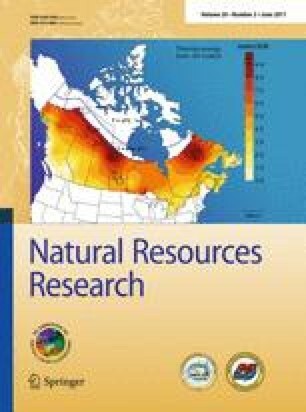 Sawatzky, D. I., Raines, G. L., Bonham-Carter, G. F., and Looney, 2009, Spatial Data Modeller (SDM): ArcMAP 9.3 geoprocessing tools for spatial modelling using weights of evidence, logistic regression, fuzzy logic and neural networks: http://arcscripts.esri.com/details.asp/dbid=15341.